As spring creeps closer and closer many of us are starting to get the itch to go outside and start digging in the dirt. While it's still too early to do that, it is time to start thinking about starting seeds indoors. If you've never started your own seeds before, there are several advantages to doing so. When starting seeds indoors you tend to get better germination rates when compared to starting seeds outdoors because you are providing them with ideal conditions. In addition to better conditions, they also won't have competition from other plants and there should be fewer insect and disease problems. Starting seeds to make your own transplants can also be cheaper than going out and buying them later in the year. You also have a lot more variety to choose from when you start your own seeds compared to buying transplants from the store (hundreds compared to a handful when it comes to popular plants like tomatoes). Fortunately, starting seeds isn't very difficult to do. There are just a few things you need in order to get started: your desired seed, a container to start them in, some growing media, water, and light. When selecting a growing media use a seed starting mix, not garden soil. Garden soil is going to have weed seeds and possibly diseases in it. Additionally, garden soil tends to be very dense and heavy, which means it won't drain as well as seed starting or potting soil will. 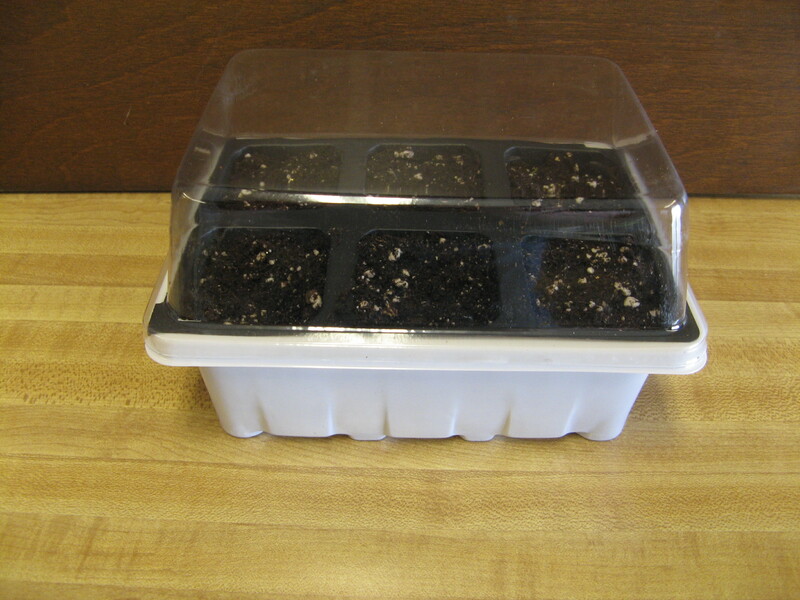 Seed starting mix is sterile and is usually made from milled peat moss, perlite, coconut coir, and vermiculite. This combination provides a light fine textured media that is ideal for starting seeds. When it comes to your container, there are a variety of different options from plastic sheets of small containers (cell flats), plastic pots, peat pots, egg shells, toilet paper tubes, to egg cartons. Whatever you choose make sure it can hold your media while allowing excess moisture to drain away (i.e. drainage holes). You have several different options when it comes to lighting too. Fluorescent grow lights are often used however, you can use regular fluorescent bulbs, a desk lamp or even a windowsill. If you decide to start your seeds on a windowsill make sure it has good southern exposure and it isn't drafty (you may need to provide some supplemental lighting though). For a more in-depth look at lighting check out Chris' post on supplemental lighting for seed starting. Once you've selected the seeds you want to grow, take a look at the back of the package. It should tell you when the seeds should be sown or planted (generally x numbers of weeks before the last frost). It may also tell you how deep the seeds need to be planted. Once you've gathered all of you supplies it's time to plant some seeds. Fill your desired container with your seed starting media, it's often easier to wet your media before filling the containers. Make sure media is settled and there aren't large air pockets in the container. Make an indentation in the media to the recommended depth. Place 2-3 seeds inside this indentation and cover with your media. Press the media down to make sure there is good contact with the seeds. Gently mist the media with water. The container can then be covered with plastic to help retain moister and warmth. Remove the plastic to spray container if the media dries out. If uncovered, the media will need to be watered more often. 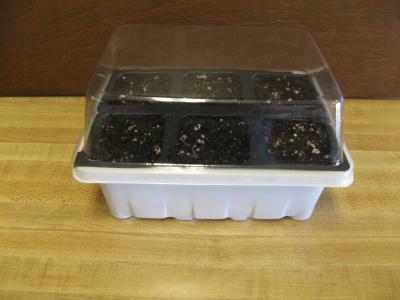 Once the seeds begin to germinate, remove the plastic cover. If you are starting seeds in a cool area it may be a good idea to get a heat mat, that is specifically made for starting seeds so that the seeds will properly germinate and to prevent disease problems. As your seedlings grow, keep your lights 3 inches above the tallest plant and provide them with 12-16 hours of light a day (it may be a good idea to get the Christmas light timer back out so you don't have to worry about remembering to turn lights on and off). Water media as needed, making sure it remains moist. Once the seedlings produce their first true leaves, you can water with a weak fertilizer. Before you know it, it will be time to take them outdoors and place them in the ground, just make sure to harden them off beforehand. Good Growing tip of the week: Start cool-season vegetables such as broccoli, Brussels sprouts, cabbage, and cauliflower around Late February and early March. Start warm season vegetables such as tomatoes and peppers around mid to late March.